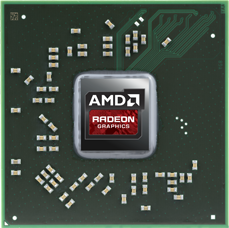 The AMD Radeon R5 M320, codenamed Meso LE (DDR3), is a dedicated entry level graphics card for laptops. It is unclear if it is based on a new chip (GCN 2.0/1.2) or an older one. Our informations indicate that it is a new chip supporting FreeSync and DirectX 12. The GPU is produced in 28nm at TSMC and offers 320 unified shaders (5 compute units). The clock speed can hit a maximum of 855 MHz. Thanks to the lower clock, the Radeon R5 M320 is sitting below the M330 and is on par with integrated solutions like the Intel HD Graphics 620 or AMD's Radeon R7 (Bristol Ridge) in benchmarks as well as gaming tests. Demanding titles are too challenging for the GPU, and even older titles like Bioshock Infinite or Tomb Raider are limited to low details.